Based in British Columbia, Enerex was formed in 1997 and their mission has always been to create a distinctive class of Nutritional Supplements offering the highest level of efficacy…. 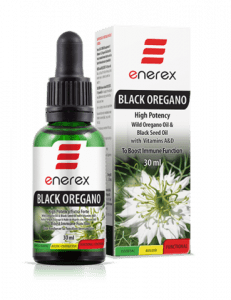 Thier fantastic Black Oregano Oil, which is a combination of wild oil of oregano, mixed with black seed oil, is fabulous for boosting the immune system along with containing potent anti-viral properties. It is a strong and very effective product andworth adding to your regime to boost your overall immunity. This product combines pure Black Seed Oil and our wild-crafted Oregano Oil to provide a one-two knock-out punch to harmful bacteria, viruses, and other invading organisms. An amazing energizer of our immune system, our high potency formula makes it superior in effectiveness and can also be used topically.